ManageEngine ServiceDesk Plus is a robust and effective help desk application that allows complete management of all helpdesk requests within your organisation. 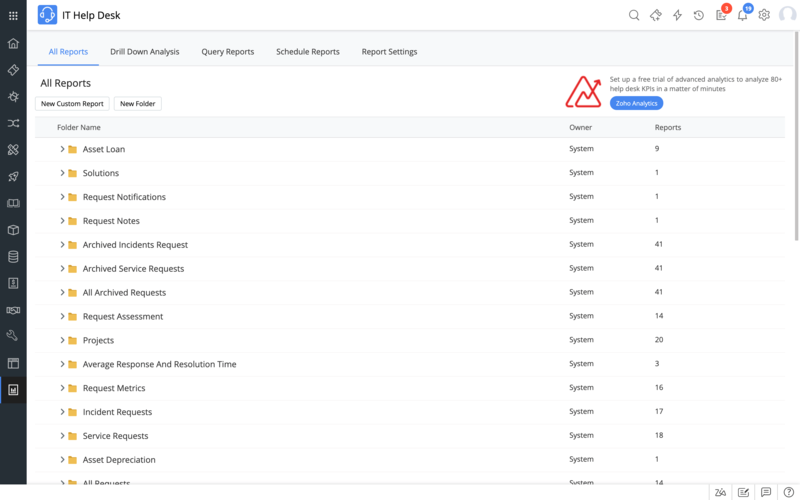 Able to track requests received over the phone or via email, ServiceDesk Plus gives you access to all of your incidents in one place. 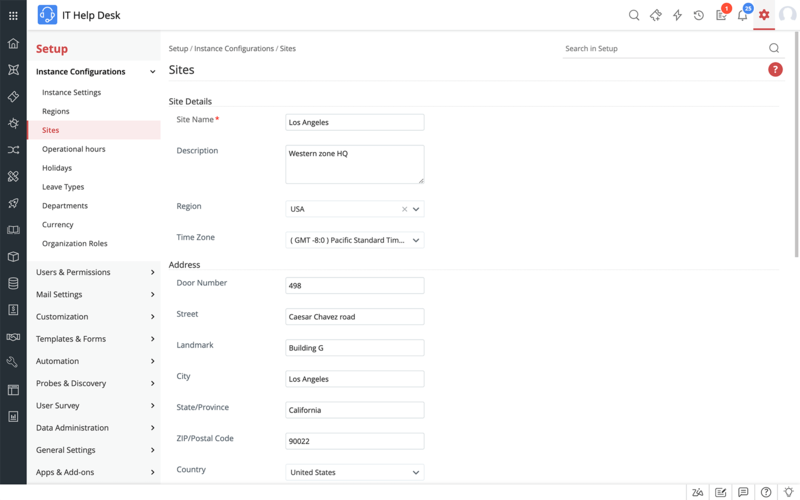 If you are looking for a help desk application that features automatic incident assignment, enables SLA escalations and allows you to define your own SLA compliance rules, ServiceDesk Plus is the ideal solution. Easy to install, simple to implement and with outstanding reporting functionality, this is one help desk solution every organisation should consider. Now, users can help themselves thanks to the self-service portal within ServiceDesk Plus. 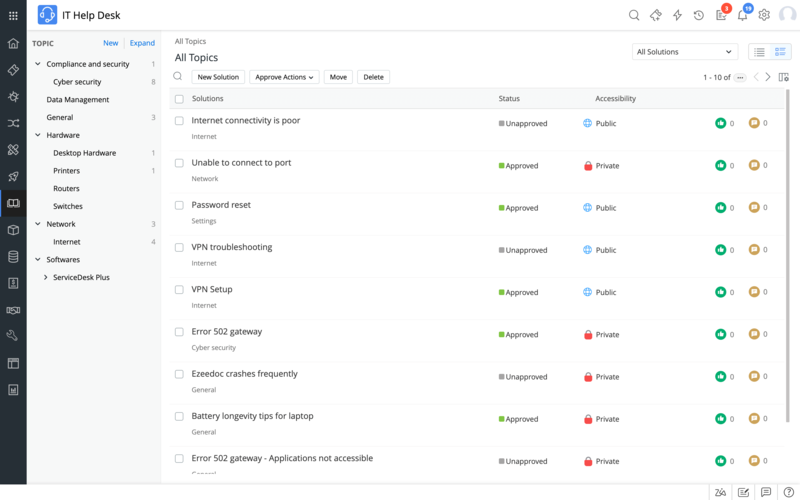 Thanks to the intuitive interface and simple controls, users can raise their own incidents, track the status of their incidents and even find a solution to their problem by browsing the ServiceDesk Plus Knowledge Base. Technical teams can also keep end users informed of planned and unexpected outages via the self-service portal. 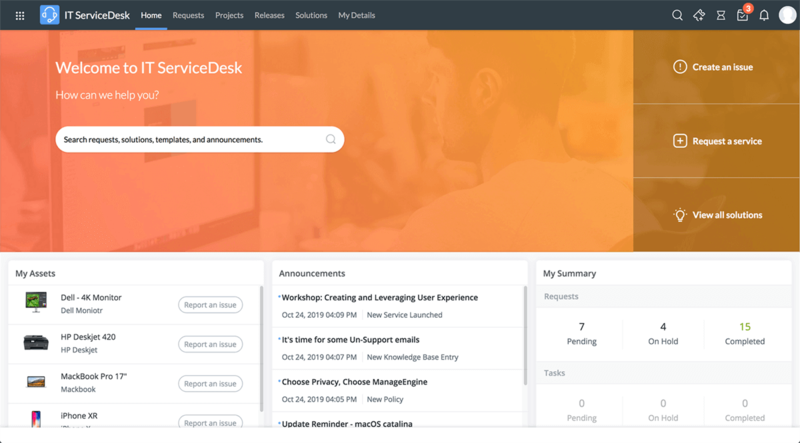 Learn more..
By taking the time to create a comprehensive knowledge base in your help desk application, you can empower users to find their own solutions. Technicians can also search the database to find solutions to problems that have been resolved before. Reduce turnaround times and improve customer satisfaction levels instantly. 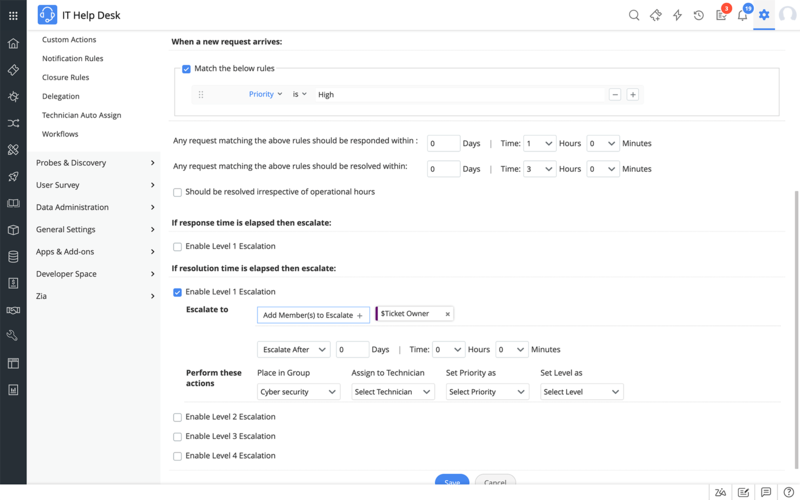 Learn more..
ServiceDesk Plus automatically converts email support requests into incidents and can then automatically assign the incident to the correct team. Imagine how much time this could save your help desk in administration. Users are happy because they know their call is being dealt with whilst your teams can get on with resolving the problems right away. Learn more..
ServiceDesk Plus is able to support multiple sites irrespective of their geographical location. Create, track and manage incidents, assets and software in different sites using this intuitive help desk application. Learn more.. Ensure incidents are resolved within the defined SLA period and improve customer satisfaction levels. 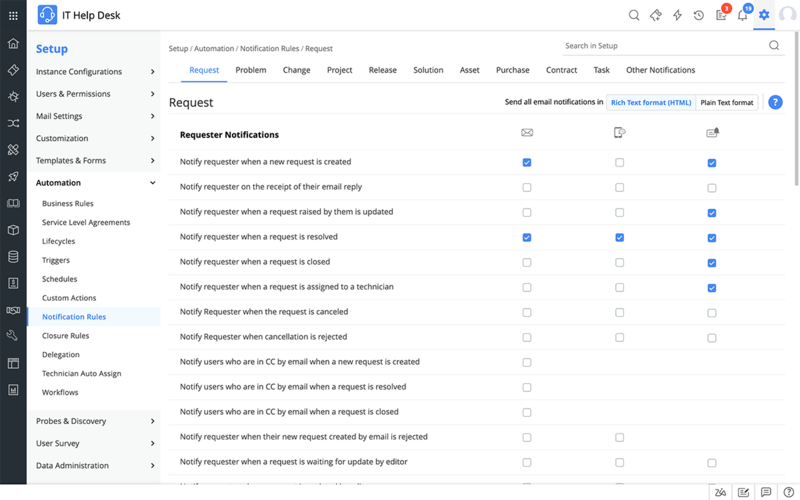 ServiceDesk Plus allows you to pre-define SLA rules and to prioritise requests accordingly. Learn more..
Do you have events or requests that were created in your previous help desk application? ServiceDesk Plus has full API support for third party software allowing you to integrate these objects seamlessly. Business Rules, when configured, allow for the automatic assignment of incidents to the correct technicians, teams, categories or levels. Using Business Rules you could see up to 70% of your incidents being assigned automatically. Think how much time that could save your help desk. Learn more.. 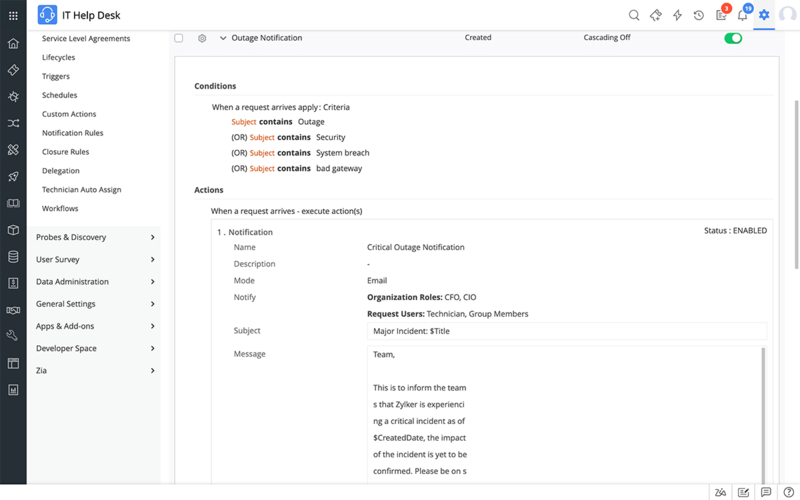 Notification Rules allow the help desk application to send out automated confirmation receipts to users and support engineers. These confirmation receipts can be sent when a call is logged, an incident is changed, when a call is assigned to a team or technician or when an SLA has been breached. Learn more..
Reports are so important in a help desk application and ServiceDesk Plus does not disappoint. Build and run reports on anything from technician performance to SLA compliance and violation. You can also delve deeper into issues using trend analysis reporting. Learn more.. The User Survey feature within ServiceDesk Plus can be very beneficial when you want honest feedback from your users. This is a great way to improve your service and customer satisfaction.